For our 10th Anniversary Celebration Olympic Culinary Loop will be conducting a year-long press tour in pursuit of identifying – and tasting - the quintessential Olympic Peninsula Chowder. 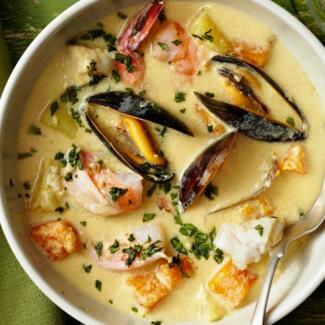 No longer will Pacific Northwest minded foodies be limited in their ordering of chowders named “New England”, “Manhattan” or seafood Cioppino hailing from San Francisco or Jambalaya influenced from Louisiana. Once crowned, the winning Olympic Peninsula Chowder is destined to be on menus, and taste buds, from coast-to-coast. Will it feature Geoduck or Razor Clams, Salmon, Spotted Shrimp, Oysters, Mussels, Crab or? Will it have a base inspired by local hard cider, creamery fresh cheese or? Clam diggers and food lovers will be heading to Ocean Shores, WA for the 13th annual Razor Clam & Seafood Festival! FREE Admission! The top Razor Clam Chowder winners will be invited to add their recipes to consideration for the ultimate prize - being crowned THE official Olympic Peninsula Chowder - this October during CrabFest in Port Angeles. Our official Olympic Peninsula Chowder will have its own flavor profile that is just as unique as this place we call home! Get Involved! Enter your recipe now and prepare your taste buds as you plan to join us at any or all of these delicious "Peoples' Taste" Chowder events!